7.1 Phase One - ‘Rest and Protection’. 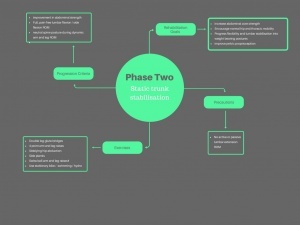 7.2 Phase Two - 'Static Trunk Stabilisation'. Lumbar stress fractures are responsible for up to 15% of all missed playing time in cricketers. This article will describe the mechanism and prevalence of these injuries in cricket and detail the role of exercise therapy in the rehabilitation of fast bowlers following spondylolisthesis. Pathology: Lumbar stress fractures to one or both of the pars interarticularis of the lumbar vertebrae are termed spondylolysis. In the case of bilateral pars fractures, the vertebral body is unstable and able to translate anteriorly on the vertebra below. This anterior translation of the superior vertebra on the inferior vertebra is termed spondylolisthesis. Lumbar spines of fast bowlers are subjected to repeated sagittal and transverse plane movements under load which leads to accelerated degenerative changes to the architecture of the lumbar spine. 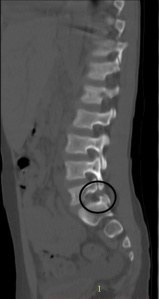 Categorisation: The typical category of spondylolisthesis seen in fast bowlers is the Wiltse Type 2: Isthmic spondylolisthesis, most commonly observed at L5-S1, which results from stress fractures to the pars interarticularis. These stresses are highest in extension and rotation which are present to a great extent in the delivery action of fast bowlers. More on the classification can be found here. Grading: Grading of spondylolisthesis is made in reference to the degree of slippage of the affected vertebra in relation to the inferior vertebra. Mixed action: There are three main bowling actions for fast bowlers, referring to the angle of the hips and shoulders in relation to the direction of bowling: front on, side on and mixed. The mixed action is defined as a difference of ≥40o between the hip and shoulder angles and a high degree of counter-rotation of the shoulders and has an increased correlation with lumbar injury due to the high degree of extension and rotation and lateral flexion experienced by the lumbar spine during the delivery stride. The ‘crunch factor’ – the product of lateral flexion and axial rotational velocity of the lumbar spine – has been implicated in the development of contralateral lumbar spine injuries in fast bowlers. Ground reaction forces: Peak ground reaction forces during the delivery stride can reach 4.1-9 times bodyweight, which is transmitted through to soft tissue and bony structures including the lumbar facet joints. If the front foot is planted whilst the lumbar spine is in combined rotation, extension and side flexion the axis of stress on the spine is altered, increasing the load on the pars interarticularis meaning the forces are not absorbed by the lumbar spine in the normal way and leading to increased risk of injury. Bowling frequency/workload: First class bowlers can deliver 300-500 balls per week during the season. This load must be appropriately managed as too many overs in a spell, or too many spells without adequate recovery leads to fatigue and increased predisposition to injury as bowling technique deteriorates, e.g. increased counter-rotation of shoulders can be observed to increase over the course of an eight-over spell of fast bowling. Recovery between games is also linked to injury risk. A prospective study of junior fast bowlers found those having less than 3.5 days recovery between bowling are over three times more likely to sustain an injury (RR = 3.1, 95% CI 1.1 to 8.9). Of these injuries, 11% were lumbar vertebral stress fractures. The prevalence of lumbar spondylolysis in the normal population is 3-6%, compared to 48.5% in athletes presenting to sports medicine facilities, and up to 24-81% in cricket fast bowlers. However, pars stress lesions in the general population may well be asymptomatic, whereas similar injuries in sporting populations tend to be symptomatic. Sixty-five percent of spondylolysis cases progress to spondylolisthesis. In a review of lumbar injuries in bowlers, Johnson, Ferreira and Hush report that Elliot et al. found, in a sample of 20 fast bowlers from the Western Australia fast bowling development squad (mean age 17.9 years), bony abnormalities were present in 55% but no figures were reported for spondylolisthesis specifically. In a 2011 review, Johnson et al. reported specific prevalence data for spondylolisthesis, where possible (four studies), which varied from 2-25%. Unfortunately the largest study in the review (n=82) only reported on spondylosis. In an 18-year period, all cricketers playing for a county club in England being referred by the physiotherapist for musculoskeletal back injuries causing missed game time lasting longer than two weeks were included in a study looking at surgery in lumbar stress fractures. Pars interarticularis defects were diagnosed in 18 players, with an average age of 20.8 years. Nine of these were bilateral, of which five were associated with spondylolisthesis. Seven of the nine unilateral defects were on the non-bowling arm side. Seven of the players included were opening pace bowlers. Amongst the bowlers, 20 lesions were detected, two at L1, two at L3, four at L4 and 12 at L5. Eight players responded well to conservative management, with 10 requiring surgical intervention. Age of athletes: Higher rates of injury are seen in younger bowlers, however there may be an element of subject bias as studies investigating lumbar bony stress injuries tend to recruit young participants. Experimentally, repetitive loading of cadaveric spines from 14-30-year-old subjects showed that spines from subjects younger than 20 years old were more susceptible to fracture through the pars interarticularis. A possible explanation for this is the greater elasticity of the intervertebral discs in younger spines, resulting in the transmission of greater shear forces to the facets and neural arch, which may not be completely ossified before the age of 20. This is refelcted int he data included in Johnson et al. 's review which shows higher prevalence of spondylolisthesis (18% and 25%) for participants with a mean age of 18 years compared to those with a mean age of 48 years (10%). Location of injury: Given the mechanics of the delivery stride, pars stress fractures tend to be found more frequently (81% vs 19%) on the non-dominant side i.e. the left side of the lumbar spine in a right-handed bowler. One small study of 36 fast bowlers found six of seven pars stress fractures were at L5 level, with two being bilateral. L5-S1 is the most vulnerable level to pars fractures due to the high loading forces and quick changes in direction between the spine and the pelvis which occur here. For athletes who do not progress with conservative management, surgery may be considered as an alternative management strategy. Further indications for, and methods of surgery for spondylolisthesis are outside the scope of this article but are discussed in detail here. In the 18-year study mentioned above, it is important to highlight the fact that all players, whether treated conservatively or surgically, returned to professional cricket, including international level, with no reported decease in performance. This suggests these are manageable injuries , with good rehabilitation potential if treated appropriately. Phase One - ‘Rest and Protection’. For healing to occur, there needs to be a period of rest. This component where aggravating activities are stopped is consistent throughout literature. A comprehensive review discussed management of low-grade spondylolisthesis in athletes. They included 14 studies investigating conservative treatment. They argued that rest is essential for management. In soccer athletes, they found that athletes who underwent activity modification as treatment rather than rest had worse outcomes in terms of return to sport in terms of time loss, but also in pain and function. Iwamoto, in his return to sport article also agreed that a period of rest should be included, and that the aim is to be pain free during daily routine activities before any sport-specific exercises or strengthening exercises occur. It is this rest period that enables athletes to return pain-free to competition. Expert John Orchard who is chief medical officer for Australia Cricket reported that it is crucial that we unload our athletes before we carry out rehabilitation. The controversial point in the literature is on the duration of rest, some saying 4-6 weeks and others arguing up to 3 months. There is debate in literature with regard to bracing during this period of rest. Literature suggests that bracing is considered if the athlete is still symptomatic after 2-4 weeks. However in a recent meta-analysis, they have reported that bracing is ineffective on outcomes. The aim of rest is to reduce extension stress of the lumbar spine and to promote anti-lordotic posture, so some authors believe bracing can help. Next goal was to start to include core stabilisation exercises. From expert opinion, athletes tend to focus on the larger muscle groups and neglect the muscles (transverse abdominis, paraspinals, internal and external obliques, rectus abdominus and multifidus) responsible for spinal stabilisation. Strengthening these muscles can provide support by lifting the spine and maintaining neutral pelvic alignment thus transferring the force and thereby decreasing the amount of load to the area. Furthermore, transverse abdominis and multifidus have local stabilisation able to prevent excessive movements at regions of instability or hypermobility. These two groups of muscles will co-contract to provide a balanced effect in the spine. Multifidus is a deep muscle which attaches directly into the vertebra, therefore it is crucially important we provide exercises to work this muscle. A systematic review on risk factors and successful interventions for cricket related LBP recommended stabilisation exercises to reduce pain and increase the anterior abdominal slide. The final goal was to improve flexibility of the key muscles. Standaert and Herring explain the importance for a broader kinetic chain assessment (pelvic and hamstrings, glutes) . Flexibility is an important component of spinal conditioning programs. Sometimes athletes may present with a secondary finding of hamstring or paraspinal muscle tightness perhaps to offer some sort of stabilisation. Exercises to address flexibility of the hamstrings, rectus femoris and tensor sascia latae musculature have been recognised as an integral component of the spinal conditioning program in those with spondylolitic disorders. This tightness can increase the lumbar lordosis due to direct effects on pelvic alignment, increasing strain on already unstable vertebrae. Static stretching is advocated for a duration of 30 seconds for 3 repetitions, twice a day, daily. With all of the stretches we have prescribed or recommended we are looking for it to remain pain-free. If a stretch induces pain, relieve pressure until pain-free and start again. During this phase, it is crucial that athletes avoid lumbar extension to avoid stressing the lumbar spine. The duration of the first stage varies amongst different athletes. It is important that there is adequate time left to rest and be pain-free to allow healing to occur before progression onto the second phase. Phase Two - 'Static Trunk Stabilisation'. Experts argue that early stages of strengthening exercises should be supervised and well-educated to ensure that technique is mastered and exercises are improving the correct components you are aiming for. Strengthening exercises are regarded as important. A systematic review investigating outcomes of strengthening approaches for low grade spondylolisthesis found that both strengthening and stabilisation exercises are important and can be of benefit. It shared the view of other experts that strengthening programmes significantly improve pain and stabilisation exercises reduce disability. There are progressions of the core stabiliser exercises used to further work on stabilising the spine aiming to reduce pain and disability in order. Stuart McGill believes that lumbar stabilisation exercises are crucial for athletes with LBP as they can lead to optimal athletic performance reducing pain. He suggested core stabilisation exercises in different postures help adapt to function and different environments that athletes are required to work in. He argued that an exercise programme addressing multifidus can pull the vertebra backwards . Another systematic review agrees that they can reduce pain and disability. These exercises initially should be performed daily to improve neural activation and motor unit recruitment, then as time progresses and pain and disability is reduced performed 2-3 times a week to improve muscular performance. With each core stability exercise, I would recommend 10-15 repetitions of 1 set, aiming to progress up to 3 sets. In phase two, there may also be an inclusion of some manual therapy. Recent literature has shown that myofascial release into thoraco-lumbar fascia, passive stretching techniques and central mobilisations into hypomobile cervico-thoracic segments are more effective at significantly reducing pain and disability , in comparison to a conventional home exercise programme. It is important to monitor progression throughout rehabilitation phases using outcome measures, tests or exercises to do this. Literature shows that using exercises incorporated in the rehab protocol is quicker, and can be more motivating for the athlete. An aspect that will be constantly monitored is pain. It is essential that all exercises in phase one and two are pain-free, so if anything is painful, regress the exercises until pain-free. A number of tests are recommended to be used for athletes. 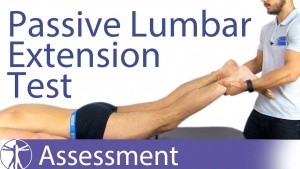 For instability, the prone instability test and the passive lumbar extension test. Muscle tests that can be used include the active straight leg raise, hamstring 90/90 test, double leg and single leg bridge. For abdominal strength, the plank and side plank will be a measure. In this phase of the rehabilitation program it is important to implement the use of dynamic trunk stabilization exercises. This reduces the bio-mechanical stresses on the lumbar spine and is a key component of a rehabilitation plan for spondylolisthesis. The athlete should be performing these dynamic stabilisation exercises in the strength range of repetition 8-12 per set, with the aim to complete 3 sets every other day. It is in this phase the athlete should resume aerobic fitness drills. However, at this stage they should be non weight bearing activities such as swimming or cycling, before moving on to activities like jogging and running. The athlete should continue to incorporate lumbar range of motion exercises in this phase, but it is the introduction of extension exercises that differentiates this phase from phase 2. It is important for the athlete to be able to perform pain-free lumbar extension before starting to partake in cricket-specific skill drills. See a summary of phase 3 below. 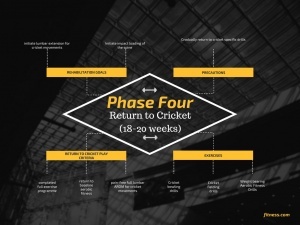 Phase 4 is the final phase before a return to cricket. 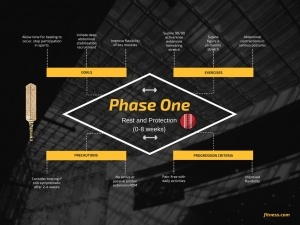 It is in this stage that attention turns to tailoring the rehabilitation to be as functional as possible in preparation for a return to the playing field. .
At this stage of the rehab plan, as a therapist you should be working closely with the strength and conditioning coaches and the cricket coaches if in an elite setting to develop the program as a multi disciplinary team. There is a need to include the use of plyometric training to progress from the strength training completed in the previous 3 phases in order to train muscular power . This will include lots of high intensity throws and jumps and should be performed in the plyometric repetition range of 3-5 repetitions per set, with the aim to complete 5 sets of each activity every other day. Activities like medicine ball slams and box jumps will replicate some of the high intensity qualities of fast bowling and is therefore key to perform before a return to the playing field. 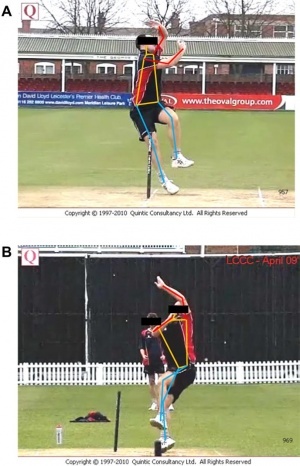 While working with cricket coaches in this phase, any technical adjustments to the athletes bowling action can be made if required to help prevent the risk of future injuries. Regarding a return to sport Eddy, Congini and Laud found that the literature currently lacking for a specific return to play protocol and a return to play is currently commonly decided by an experts opinion. Most experts agree that for a return to cricket from spondylolisthesis an athlete needs to be symptom free and have full, pain free, active range of motion in the lumbar spine with near to full baseline strength. A fast bowler returning from a spondylolisthesis should have completed the full rehabilitation plan prescribed to them by a therapist as well a returning to baseline aerobic fitness levels while also having adequate spinal awareness and mechanics. Furthermore, they should be able to complete all functional cricket movements without pain or compensations. The yoyo test is a reliable test for v02 max in cricketers and is therefore a good indicator of aerobic fitness levels in cricket athletes. Psych-social considerations should also be made following a long term injury in athletes. Athletes may spend longer than expected in the final phases of their rehabilitation program to to refine skills and mentally prepare for a return to the playing field. Return to sport rates with conservative management of spondylolisthesis are between 80.1 and 89.2%. The general consensus in the literature is that it can take 5-7 months to return to sport from a spondylolisthesis. However, this is expected to be quicker for a full time elite athlete who will be receiving daily treatment. See a summary of phase 4 below. https://youtu.be/pgc5K_GkgTo - Please click here to see a video of suggested exercises based upon current literature for Cricketers with Spondylolisthesis. It is important that cricketers are constantly completing exercises addressing flexibility and spinal stabilisation. These should be done throughout the year (not just during the season) to ensure the athlete is maintained in optimum condition and to prevent any injury. Therefore, it would be recommended that cricketers should be completing exercises like the ones recommended in this programme to prevent any spondylolitic disorders. Given the contributing factors of young age and increased bowling load to the increased risk of spondylolisthesis and other lumbar stress injuries, monitoring workload in younger players is a prudent measure to take to safeguard against the development of these conditions. The English Cricket Board (ECB) have set out directives for clubs to protect young fast bowlers (U19) to help them train and play without increasing the risk of these injuries. There are limits to the number of overs per session and overs per day for matches, with U13s limited to 5 overs per spell and 10 overs per day, increasing to 7 overs per spell and 18 overs per day for U18/19s. Similar limits are set for practice sessions, 30 balls per session and 2 sessions per week for U13 up to 42 balls per session and 3 sessions per week for U18/19s. There is also information on the amount of force absorbed by different playing/practice surfaces (e.g. concrete 0%, natural turf 34%, synthetic + underlay 49%) which will decrease the high ground reaction forces responsible for increasing the stress on the lumbar spine during the delivery stride. The concept of mixed bowling action is also discussed and it is recommended that coaching staff help bowlers develop either a side on or front on technique to mitigate the effect of the lumbar stresses described earlier in this article. These monitoring measures, together with intelligent pre/rehabilitation training as detailed in this article and early detection of lumbar stress responses, before they develop into stress fractures and potentially spondylolisthesis, should help reduce the incidence of these injuries and reduce missed playing time. Lumbar bony stress injuries are common amongst fast bowlers in cricket. Stress fractures, caused by high stress forces through the lumbar spine, exacerbated by mixed bowling action resulting in hyperextension, rotation and side flexion under excessive load, can progress to spondylolisthesis if not treated. For athletes with spondylolisthesis, conservative management via exercise therapy has been shown to have excellent prognosis and players should expect to return to sport after successful rehabilitation in a minimum of 20 weeks. Rehabilitation follows four stages and aims to allow for a period of rest and protection for the defect to heal,followed by regaining full ROM and strength in the surrounding muscles of the lumbar spine to allow for pain free completion of functional skills and tasks required to return to sport. ↑ Orchard, J., Kountouris, A. and Sims, K. (2016). Incidence and prevalence of elite male cricket injuries using updated consensus definitions. Open Access Journal of Sports Medicine, Volume 7, pp.187-194. ↑ 3.0 3.1 3.2 3.3 3.4 Arora, M., A Paoloni, J., Kandwal, P. and Diwan, A. (2014). Are Fast-Bowlers Prone to Back Injuries? Prevalence of Lumbar Spine Injuries in Fast-Bowlers: Review of MRI-Based Studies. Asian Journal of Sports Medicine, 5(4). ↑ Gaillard, F. (2018). 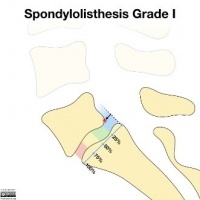 Spondylolisthesis grading system | Radiology Reference Article | Radiopaedia.org. [online] Radiopaedia.org. Available at: https://radiopaedia.org/articles/spondylolisthesis-grading-system [Accessed 25 May 2018]. ↑ 6.0 6.1 Ranson, C., Kerslake, R., Burnett, A., Batt, M. and Abdi, S. (2005). Magnetic resonance imaging of the lumbar spine in asymptomatic professional fast bowlers in cricket. The Journal of Bone and Joint Surgery. British volume, 87-B(8), pp.1111-1116. ↑ 7.0 7.1 Morton, S., Barton, C., Rice, S. and Morrissey, D. (2013). Risk factors and successful interventions for cricket-related low back pain: a systematic review. British Journal of Sports Medicine, 48(8), pp.685-691. ↑ 8.0 8.1 8.2 Johnson, M., Ferreira, M. and Hush, J. (2011). Lumbar vertebral stress injuries in fast bowlers: A review of prevalence and risk factors. Physical Therapy in Sport, 13(1), pp.45-52. ↑ 9.0 9.1 9.2 McGrath, A. and Finch, C. (1996). Bowling cricket injures over: a review of the literature. Victoria, Australia: Monash University Accident Research Centre. ↑ Ross A. In Taylor, C. (1996). Injury prevention strategies: Cricket. Kidsafe 1996a; Autumn: 19-20. ↑ 11.0 11.1 11.2 11.3 11.4 11.5 Johnson, M., Ferreira, M. and Hush, J. (2011). Lumbar vertebral stress injuries in fast bowlers: A review of prevalence and risk factors. Physical Therapy in Sport, 13(1), pp.45-52. ↑ Dennis, R. J., Finch, C. F., & Farhart, P. J. (2005). Is bowling workload a risk factor for injury to Australian junior cricket fast bowlers? British Journal of Sports Medicine, 39, 843-846. ↑ Elliott, B. C., Hardcastle, P. H., Burnett, A. F., & Foster, D. H. (1992). The influence of fast bowling and physical factors on radiologic features in high performance young fast bowlers. Sports Medicine Training and Rehabilitation, 3(2), 113e130. ↑ 15.0 15.1 15.2 Ranawat, V., Dowell, J. and Heywood-Waddington, M. (2003). Stress fractures of the lumbar pars interarticularis in athletes: a review based on long-term results of 18 professional cricketers. Injury, 34(12), pp.915-919. ↑ Stretch, R. and Venter, D. (2003). Cricket injuries - a longitudinal study of the nature of injuries in South African cricketers. South African Journal of Sports Medicine, 15(2), p.4. ↑ Uwhealth.org. (2018). [online] Available at: https://www.uwhealth.org/files/uwhealth/docs/sportsmed/Spondy_Rehab_Guide.pdf [Accessed 27 May 2018]. ↑ 18.0 18.1 18.2 Nau, E., Hanney, W. and Kolber, M. (2008). Spinal Conditioning for Athletes With Lumbar Spondylolysis and Spondylolisthesis. Strength and Conditioning Journal, 30(2), pp.43-52. ↑ Mail Online. (2013). Bowling coach Saker pleased with Broad form after injury despite tricky conditions. [online] Available at: http://www.dailymail.co.uk/sport/cricket/article-2294711/David-Saker-pleased-Stuart-Broad-comeback.html [Accessed 27 May 2018]. ↑ 20.0 20.1 Bouras, T. and Korovessis, P. (2014). Management of spondylolysis and low-grade spondylolisthesis in fine athletes. A comprehensive review. European Journal of Orthopaedic Surgery & Traumatology, 25(S1), pp.167-175. ↑ 21.0 21.1 21.2 21.3 Iwamoto, J. (2010). Return to sports activity by athletes after treatment of spondylolysis. World Journal of Orthopedics, 1(1), p.26. ↑ Klein, G., Mehlman, C. and McCarty, M. (2009). Nonoperative Treatment of Spondylolysis and Grade I Spondylolisthesis in Children and Young Adults. Journal of Pediatric Orthopaedics, 29(2), pp.146-156. ↑ 23.0 23.1 23.2 Standaert, C. and Herring, S. (2007). Expert Opinion and Controversies in Sports and Musculoskeletal Medicine: The Diagnosis and Treatment of Spondylolysis in Adolescent Athletes. Archives of Physical Medicine and Rehabilitation, 88(4), pp.537-540. ↑ 24.0 24.1 24.2 24.3 Perrin, A. (2016). Lumbosacral Spondylolisthesis Treatment & Management: Acute Phase, Recovery Phase, Maintenance Phase. [online] Emedicine.medscape.com. Available at: https://emedicine.medscape.com/article/2179163-treatment#showall [Accessed 27 May 2018]. ↑ Mallac, C. (2012). Cricket injury risks | Sports Injury Bulletin. [online] Sports Injury Bulletin. Available at: https://www.sportsinjurybulletin.com/cricket-injury-risks/ [Accessed 27 May 2018]. ↑ Hardwick, D., Tierney, D., Fein, C., Reinmann, S. and Donaldson, M. (2012). Outcomes of strengthening approaches in the treatment of low-grade spondylolisthesis. Physical Therapy Reviews, 17(5), pp.284-291. ↑ Miller, J. (2018). Spondylolisthesis. [online] Physioworks.com.au. Available at: https://physioworks.com.au/injuries-conditions-1/spondylolisthesis [Accessed 27 May 2018]. ↑ 28.0 28.1 McGill, S. (2007). Low back disorders. Champaign, IL: Human Kinetics. ↑ Garet, M., Reiman, M., Mathers, J. and Sylvain, J. (2013). Nonoperative Treatment in Lumbar Spondylolysis and Spondylolisthesis. Sports Health: A Multidisciplinary Approach, 5(3), pp.225-232. ↑ Mohanty, P., Pattanaik, M., Mishra, S. and Fatoye, F. (2015). Effectiveness of manual therapy in spondylolysthesis. Physiotherapy, 101, pp.e1022-e1023. ↑ Ferrari, S., Vanti, C. and O'Reilly, C. (2012). Clinical presentation and physiotherapy treatment of 4 patients with low back pain and isthmic spondylolisthesis. Journal of Chiropractic Medicine, 11(2), pp.94-103. ↑ PhysioTutors (2017). Passive Lumbar Extension Test. [video] Available at: https://www.youtube.com/watch?v=2OyQGH9vzok [Accessed 27 May 2018]. ↑ Ikeda, Y., Miyatsuji, K., Kawabata, K., Fuchimoto, T. and Ito, A. (2009). Analysis of Trunk Muscle Activity in the Side Medicine-Ball Throw. Journal of Strength and Conditioning Research, 23(8), pp.2231-2240. ↑ 34.0 34.1 Talukdar, K., Cronin, J., Zois, J. and Sharp, A. (2015). The Role of Rotational Mobility and Power on Throwing Velocity. Journal of Strength and Conditioning Research, 29(4), pp.905-911. ↑ Dubousset, J. (1997). Treatment of Spondylolysis and Spondylolisthesis in Children and Adolescents. Clinical Orthopaedics and Related Research, 337, pp.77-85. ↑ McGill, S. (2007). Low back disorders. Champaign, IL: Human Kinetics. ↑ Nau, E., Hanney, W. and Kolber, M. (2008). Spinal Conditioning for Athletes With Lumbar Spondylolysis and Spondylolisthesis. Strength and Conditioning Journal, 30(2), pp.43-52.